Coast Guard families usually live near their installations-along coastlines but also far inland on rivers that connect to a coastline. Do you serve a region of the country where Coast Guard families can be found? Check out the map in your region of the country for your local Coast Guard! This article will help your center locate and serve Coast Guard families and identifies possible best points of contact for outreach. Coast Guard families have been described as one of the three types of “invisible” military families, along with the National Guard and Reserves. Why invisible? Installations are relatively small, and families frequently live in remote coastal locations. Many people aren’t even aware that the Coast Guard is a military service. (The Coast Guard is operated by the Department of Homeland Security, but in wartime it can be called to service under the Department of Defense). Coast Guard families receive some of their benefits through their own Coast Guard system, but health benefits, including mental health care, come through TRICARE, a program of the Defense Health Agency. Like other active duty families, they deal with repeated moves, new schools, and deployments. These factors may create stress for all children and youth in Coast Guard families and affect continuity of services for children with disabilities. Check out the Interactive Map for your state or region on the Branch website, branchta.org. The light blue icons on the map are Coast Guard facilities. Most of the families will live close by, and you can determine which school district they live in. Get onto Facebook and search for “Coast Guard families” or just “Coast Guard”. You’ll find out what families are interested in, and maybe get some additional contacts. Remember, military families love to connect online, and Coast Guard families are active in the Facebook world. Try Twitter, too! 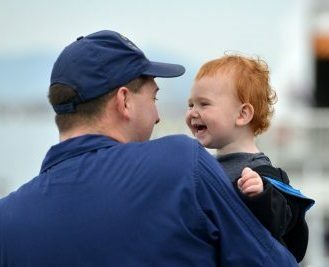 To arrange trainings and workshops or participate in Coast Guard family events, contact a Family Resource Specialist (FRS). FRS are regionally-based family support staff that provide remote services for Coast Guard families in the Special Needs Program (SNP). SNP is the Coast Guard version of the DoD Exceptional Family Member Program (EFMP). Like EFMP, SNP has two purposes, (1) helping to ensure that service members are assigned to locations where services for their family member with special needs are available and (2) providing support to families who have a member with special medical or educational needs. FRS contact information for Coast Guard installations in your state or area is available on our Interactive Maps. The Branch finds that FRSs are happy to find a community-based resource to assist Coast Guard families in local schools and with other programs at their parent center and in the civilian community. The FRS can also put you in touch with another good outreach resource, the Coast Guard Ombudsman Program. Ombudsmen are volunteers, usually Coast Guard spouses, who are screened and selected by an installation’s command to provide information between the command leadership and the families within that command. They refer families to Coast Guard programs and civilian resources and help to resolve family problems. Ombudsmen undertake rigorous training in order to assist families. When you work with a Coast Guard family that could use support within the Coast Guard “system”, you can suggest the family contact their local Ombudsman. (Find the Ombudsman through the Ombudsman Registry at https://cgombudsmanregistry.org/?m=login (no login is necessary). Click on the “Contact Your Ombudsman” icon at the bottom right of the page, select the region where the family is located, and in the new page, select the command. The email will go directly to that Ombudsman). Would you and your colleagues like an introduction to your regional Family Resource Specialist? The Branch Team is happy to assist-just contact us, and you will soon be “on the radar” for Coast Guard families in your area or state! Meet Your New Super-Volunteers-Military Families!